Mosaic software provides workflow management and inventory tracking to enable a seamless, error-free, sample supply chain and audit trail. It integrates with a huge variety of other automation and software to bring these into your laboratory workflow and provide a 21 CFR Part 11 compliant audit trail for the entire sample life cycle. Mosaic’s modular approach makes it easy to start small and upgrade or extend the software’s functionality whenever needed. Titian is the industry leader in providing sample management software for the life sciences. Brooks Life Sciences is a leader in automated cold-chain sample management for drug discovery and biostorage applications. With has more than 16 years of experience and over 200 automated stores installed worldwide, Brooks Life Sciences understands sample management. Brooks Life Sciences delivered the world’s first automated -20°C storage system in 1997 and the first large scale automated -80°C store in 2006. Its reliable, flexible automated storage solutions are used by 9 of the top 10 pharmaceutical companies. Mosaic software will turbocharge your Brooks Life Sciences store by connecting it with your inventory management for the entire sample life cycle, and providing a 21 CFR Part 11 compliant audit trail. Titian’s Mosaic software allows you manage and record the details of any sample with flexible and intuitive interfaces whilst also representing your entire hierarchy of storage, including freezers, shelves, cupboards and automated stores. By using Mosaic software to integrate with your Brooks Life Sciences Tube Auditor™, you can easily find free space, automatically record all changes to samples and search and report on samples. 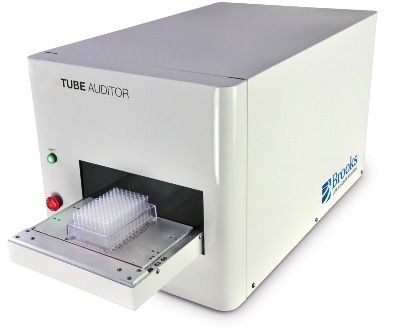 The Tube Auditor is used to check the solubility state and/or volumes of solution tubes. Results files from the readers are swept automatically into Mosaic where specific file translators reads the information and updates the inventory accordingly. Closing the Screening Loop - From Logistics to Automation to Analysis and Back. 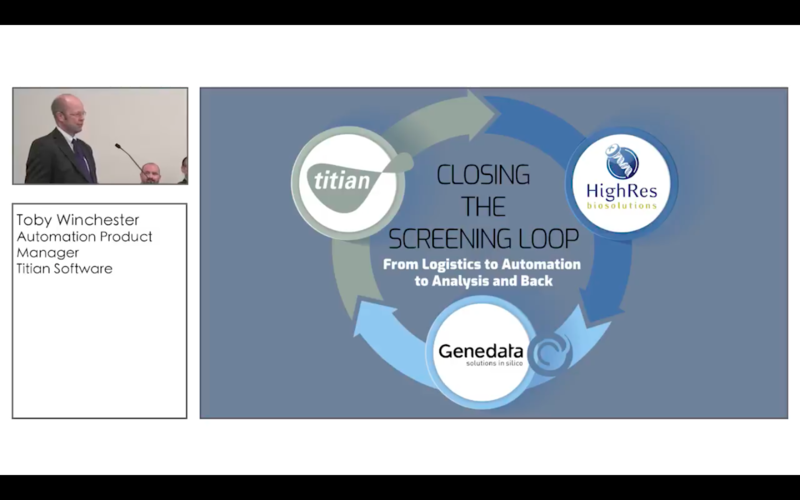 An introduction to the collaboration of Titian, HighRes and Genedata as presented at SLAS San Diego in February 2018. Thanks - your download should automatically begin.